Being literally 5 metres away from this beautiful mountain gorilla, something you can't describe in words... Amazing. Hirwa means ‘Lucky’, and there's a reason why they have been given this name. There are about 8 different mountain gorilla families spread out amongst the Virunga Volcano National Park and our guide chose the Hirwa group for us to visit today. The alpha silverback, named Lucky, used to belong to another group before forming his own. He was ranked as the 3rd male in the group. Each family can only have one alpha male silver back, and any other adult male who dares to steal his girlfriends will find themselves being dragged into a private corner of the jungle by the alpha to go head to head in a punching, kicking, biting battle, where some can even loose their lives. When Lucky was a member of his first group in 2005, he constantly found himself getting beaten up by his alpha because he kept mating with all the females… daily! He has scars all over his body from the numerous times he got himself into a fight. One day, he decided he had enough, and he separated from his group to make he's own, taking with him 5 girlfriends along the way. This is supposedly super rare for so many females to follow the one silver back and leave an alpha, but he is seen as a very handsome and strong silver back, making his separation from the group successful and thats why he’s called lucky. Today, 10 years later his family has 18 members, including his 5 beautiful ladies and all their babies, including the first known recorded set of twins (who are 6 months old and so cute, you have to see the photos below). Before coming across the Hirwa family, we were taught the basics in communication between gorillas. We were taught how to ask them if we were allowed to come in, just like we would knock on someones door before entering their house. We were also taught how to read their facial expression and hear them telling us we were either welcome, or not welcome… Lucky for us, they welcomed us into their home! Three of the gorillas including Lucky, one of he's ladies and a baby had a cold when we hung out with them and you could see they looked lethargic and sniffly. Its amazing the similarity we have to them, sharing 98% of our DNA with them. They spent the entire time resting, every now and then opening their eyes to take a peep at who we were and what we were doing. We spoke to the vet who had visit the Hirwa family just moments before us, who mentioned they were keeping a close eye on them to make sure their cold didn't turn into a bacterial infection. If so, they would come back tomorrow to give them a dose of antibiotics. Being a critically endangered species due to poachers, with only 880 left on this planet, its important to look after the health of the mountain gorillas while still allowing them to live a normal life in their own habitat. The guides, porters and vets take so much pride in looking after these guys and conserving the national park, you can really see how much they love and nurture them, and how much the gorillas love and protect them back. The best part about this whole thing is that by coming here and paying to see them, we’re also contributing to keep these amazing creatures around for longer. An amazing experience that I highly recommend to anyone who has Africa on their bucket list. The details of our beautiful accommodation, tour guide (who picked us up from the airport and takes us everywhere while we're staying here) and the National Park details are below after the photos. This is a must do and a lifetime experience which is totally unable to be portrayed through words or photos. Mumma breast feeding her babies. Lucky, the alpha silver back of this group. The size of him just cant be captured in a photo... He is HUGE! 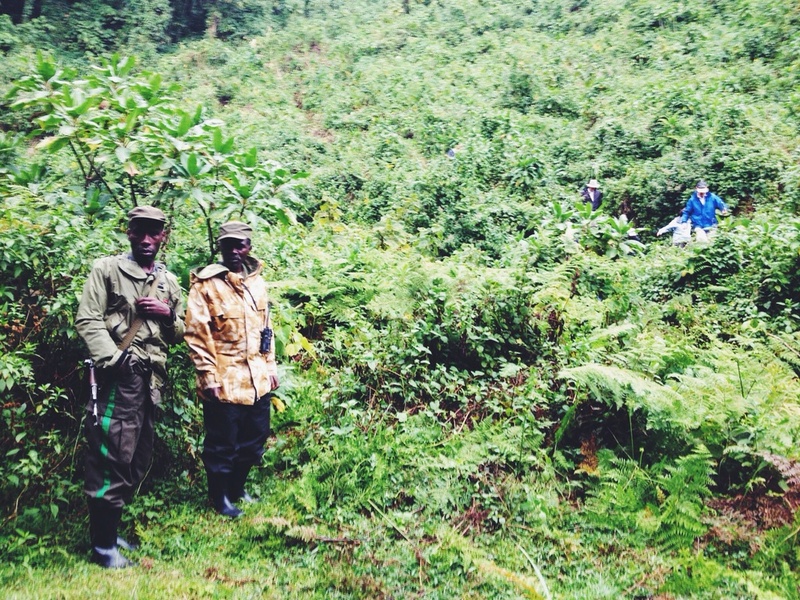 Virunga national park guide and tracker. The view from their living room! Myself and Anna. Taking it all in! Our beautiful accomadation at the Mountain Gorilla View Lodge, Rwanda - Africa. The view from our bed! The beautiful volcanic jungle, Just there. 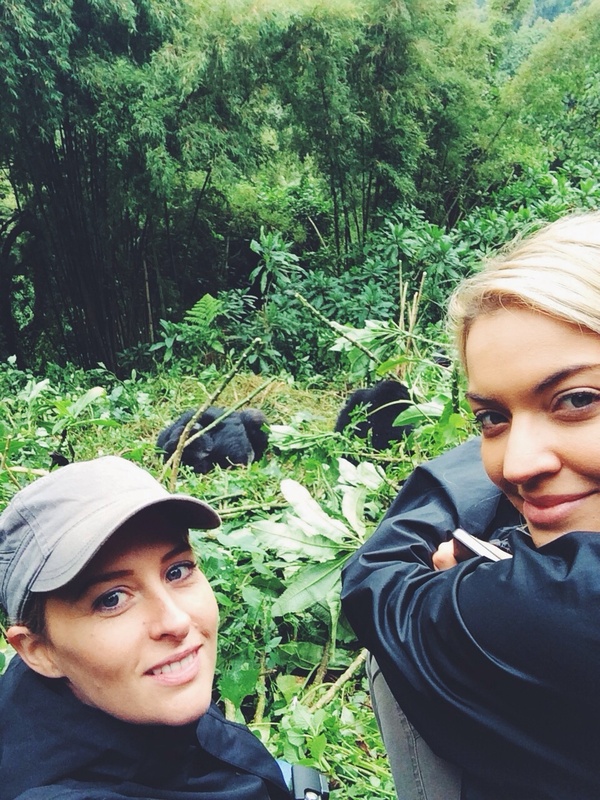 Accom: Mountain Gorilla View Lodge - Click here. Gorilla Trek: Amber Expeditions - Click here. Guide: Ask for Arthur via Amber Expeditions!